Members of the Ludlowe cheerleading team pose with its championship trophies after winning the Grand Championship on March 25 at Disney World in Orlando, Florida. FAIRFIELD - It had become, what Ludlowe cheerleading coach Ashley Carolan called, a running joke. 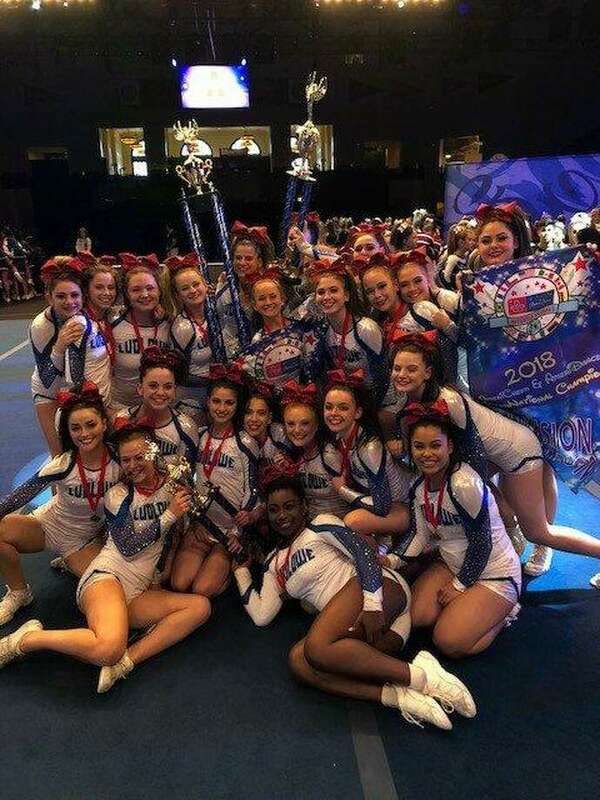 Year in and year out, whenever the Falcons’ cheer team competed in a first-class event, like the Class LL championships or the New England tournament, they always seem to come up just short of taking home the first-place trophy. Despite finishing second in this season’s FCIAC and Class L tournaments and placing third at the New England’s, its simply not the same feeling as winning. But that all changed with a trip to Orlando, Florida. The Ludlowe cheerleading recently team won the overall Grand Champion trophy, the High Point trophy and the National Championship in the varsity advanced all-Music Division at Walt Disney World. Indeed. The Falcons’ cheer squad spent nearly 10 months working on, and perfecting, the two-and-a-half minute routine - part of which was performed to Queen’s ‘We Will Rock You’ -- that captured the first place trophy. Ludlowe, which left for Florida on March 22, was the lone state school in the competition. They spent most of Friday rehearsing the routine and then had to perform it twice, once on Saturday and again on Sunday. The first performance is worth 40 percent of the team score, the second performance is worth 60 percent. “So, basically on Sunday, you have to be perfect,” Carolan said. Not only did they lock down the first-place trophy in the National Championship category, they also jumped from third place to first in the Grand National division, which also made them high point champs. It cost each girl close to $1,100 to attend the competition, much of that being raised through various fund-raisers at football and basketball games and through the selling of T-shirts with various sponsors’ logos on the back. “I have 10 seniors and I think six of the 10 have been together since freshmen year,” Carolan said. “They tried out as freshmen, they had a little background in cheer, but they definitely needed some building. So, we’ve been building them up since they were freshmen. Woodfine and Serenity Appiah were the seniors on the Falcons’ squad. Juniors were: Lily Lombardo, Michaela Murdock and Caroline Placey. Sophomores were: Chole Coseglai, Emma Kortmansky and Rebecca Roll and the freshmen were: Charlie Beri, Eliza Hummerstone, Jordyn Imbrogno, Isabelle Keogh, Jordan Perillo, Jenna Simonelli and Sophia Spagna. Carolan’s assistant coaches are: Amanda O’Brien, Morgan Carolan and Erin Colonnese. Ludlowe was FCIAC cheer champs in 2010, 2012, 2013, 2015 and 2016. They were runner-up in 2017. The Falcons were second in the Class LL tournament (2018, 2017, 2012, 2011), third in 2016 and 2009, fourth in 2015 and seventh in 2014. They won the LL title in 2013.